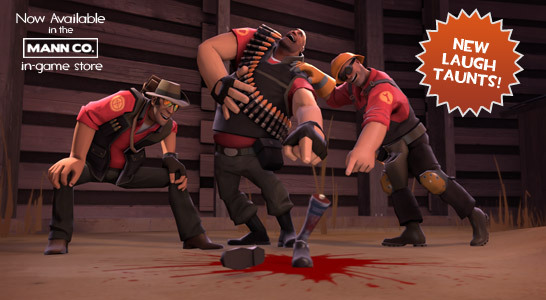 Discussion in 'Team Fortress 2 Talk' started by tf2.com, Jun 24, 2011. Welcome to Stuff Friday! Without further adieu, here's some stuff! Capture a point. Shoot a guy. Walk ten feet. Think about walking ten feet and decide not to. Whatever the occasion, celebrate it with the Meet the Medic, a custom taunt that allows you to punctuate anything you do, no matter how trivial, with god rays, orchestral swells and an explosion of doves. Put Meet the Medic… On Your Wall! Let's say you enjoyed Meet the Medic. Let's say you enjoyed it so much--and especially that one scene where the Medic walks out of his lab all cool with a bunch of doves flying around him--that you wanted to put it up on your wall. First you'd have to buy a big-screen TV. Then you'd have to buy a computer, connect it to the internet, and have the TV play Meet the Medic in an endless loop. Then you’d have to hire a butler to tell you every time that one scene comes up so you can go look at it. And don't forget laser eye surgery so you can see the image at museum quality. Total price: $140,000. Per year. What a bunch of crap, right? Now what if we were to tell you that Valve engineers came up with a better solution? Introducing the limited edition Meet the Medic lithograph, available now at the Valve Store. First come, first serve, folks! Man, is your wallpaper stupid. We're just guessing, because compared to the new hi-res, wallpaper-caliber Über Update art now available in the Artwork section, trust us, it's stupid. Love the Meet The Medic "dovesplosion" taunt. Oh, and we are still waiting for the high five taunts, Valve. Shame on you, Valve, telling me my Rainbow Dash wallpaper is stupid. It is not stupid. Hah, I just checked the main page for the day 5 update 10 mintues ago. Closed it, hit refresh on TF2maps. Mine's better because it's Applejack. Oh god we're going to have a pony war, aren't we. You know who had a lot to say about wars? The Soldier. Let's see what he has to say about this. While we're talking about pony backgrounds, I'm currently alternating between a grey background with Derpy Hooves' eyes, and one with Rainbow Dash performing the Sonic Rainboom. It's pretty damn awesome.